The leads that are in the Queue are actively looking for buyers to sell to. This is where your Hosted leads that fail to sell will go, as long as all required information is included. You can also choose to send Host-n-Post failures to the Queue, where they will then actively look for other buyers to sell to. This setting is located in the Lead Gen tab of a Host-n-Post offer card. You can choose to send rejected leads to the Review Queue, which is set up on your vertical while you're creating required or validated fields. 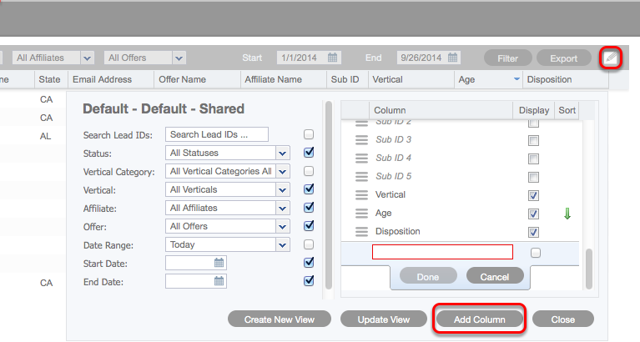 You can also choose to send leads to the Review Queue at the affiliate level. The leads that are in the Review Queue can be reviewed, then approved and sent to the Queue to be sold, or can be rejected which would send the leads to the Scrub Queue. The Scrub Queue is where you'll find all of your rejected and thrown out leads. You do still have the option of sending leads from the Scrub Queue to either the Queue or the Review Queue. By default, the fields shown in the queues only includes basic fields, but non-basic fields can be added into these views using custom views. 1. 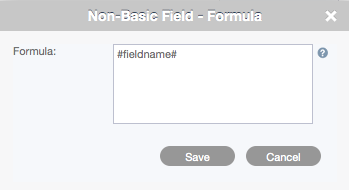 Click on the 'Edit View' icon in the upper-right corner to see the full list of available (basic) fields. 2. Next, click on 'Add Column' to add a new column to display a non-basic field. 3. Name your column according to the field you're adding. 4. Check the right-hand checkbox to display that column (you can also do this later). A new window will appear asking you for the formula. Traditionaly this is where you would add a calculation formula, like #Paid#/#Clicks#, but in this case you will add a token for a field name. This works exactly the same as when setting up a Buyer's XML post and mapping field tokens. Wrap the field name from your vertical (2nd column from the left) in hashtag (#) signs as seen above and please keep in mind that this is case sensitive. Once you've clicked Save, the column should populate in your view.